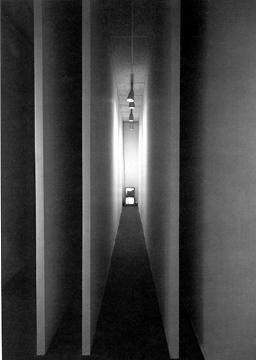 "Nauman set two monitors above one another at the end of a corridor almost ten meters long and only 50 cm wide. The lower monitor features a videotape of the corridor. The uppermost monitor shows a closed-circuit tape recording of a camera at the entrance to the corridor, positioned at a height of about three meters. On entering the corridor and approaching the monitors, you quickly come under the area surveyed by the camera. But the closer you get to the monitor, the further you are from the camera, with the result that your image on the monitor becomes increasingly smaller. Another cause of irritation: you see yourself from behind. Moreover, the feeling of alienation induced by walking away from yourself is heightened by your being enclosed in a narrow corridor. Here, rational orientation and emotional insecurity clash with each other. A person thus monitored suddenly slips into the role of someone monitoring their own activities. (source: Dörte Zbikowski, in: Thomas Y. Levin (ed. ), CTRL[SPACE]. rhetorics of surveillance from Bentham to big brother, ZKM | Center for Art and Media, Karlsruhe 2001)"